"Put this in your pipe and smoke it." Drug comedies come and go in phases. Though many were successful in the seventies, the eighties and nineties saw a major lack of such films. It is odd, then, that Pineapple Express was so very successful when it came out. Very much unlike any of the other films out at the time, this movie gave viewers a unique look at the comedy styles of two men that generally found themselves playing the sidekicks in other films. Whether because of this or in spite of it, Pineapple Express succeeds both as a drug film and as a comedy. A true stoner comedy, Pineapple Express follows subpoena server Dale (Seth Rogan) and his pot dealer Saul (James Franco) as they go on the run. Dale is the only witness to a crime, and the two must do what they can to make sure that he avoids the wrath of a major drug dealer. Unfortunately, neither possesses a great deal of social skill or ability, instead relying on their own assumptions and marijuana-related paranoia to get through the day. Interspersed with the attempts to escape the dealer are the two's interactions with Red (Danny McBride), another dealer. The trio make it through fights, arrests and even their own attempts to save themselves to an action-packed conclusion. The movie has relatively little in common with other drug comedies, instead packing in a great deal of action alongside the drug-related humor. More of the humor comes from Franco, Rogan or McBride's antics instead of the drug use, and a variety of the situations would be just as funny if the protagonists were sober. Even with that said, drug use does feature very heavily, and those who know a bit about marijuana-related culture will have any easier time understanding some of the jokes in the film. 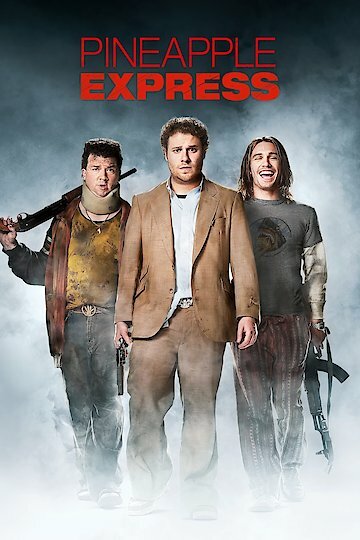 In the end, Pineapple Express is a comedy that really stands on its own two feet. It borrows a good deal from the pot comedies of the seventies, but is very much a modern film. Filled with cameos by actors like Craig Robinson and Bill Hader, it features some of the better stars of the early 21st Century. Even if you are not a huge fan of either of the actors or drug comedies in general, Pineapple Express deserves at least one viewing. You might be surprised by what you find, and you might have an entirely new appreciation for the genre. Pineapple Express is currently available to watch and stream, download, buy on demand at Netflix, IFC, Amazon, Vudu, Google Play, FandangoNow, iTunes, YouTube VOD online.